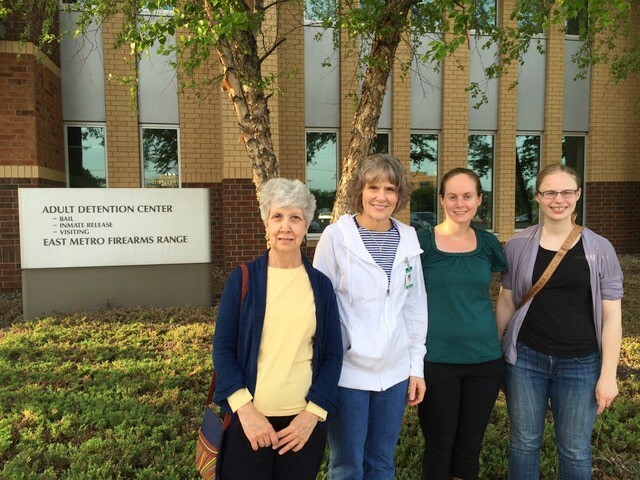 Left to right: CWF volunteers Margo Casey, Mary Lorentz, Rebecca Orrick, Lisa Rawlins. CWF was founded by the late Reverend John Guttermann in 2010. 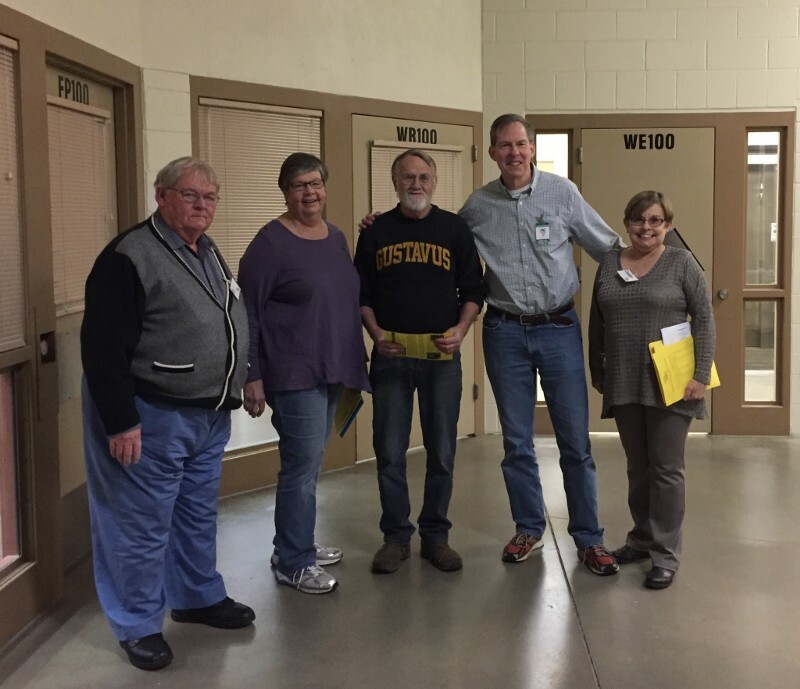 On the first and third Sundays of every month, we visit the Freeborn County Adult Detention Center in Albert Lea, MN: five CWF visitors meet with a total of thirty-five to sixty attendees over the course of two hours, men from one pod for the first hour and men from another pod for the second. After checking in, we’re escorted to a small classroom with six tables. A pod door opens and roughly twenty-five gentlemen — detained immigrants — enter in a long line, waiting to sign in, smiling, shaking our hands, wondering how we’re doing. It’s always a mix of new folks and those we’ve met on prior visits, people from Mexico and Central America, and from Bangladesh, Thailand, Laos, Vietnam, Somalia, Sudan, Congo, Liberia, Kenya and more. We split into five groups: usually two groups of Spanish speakers and three of English. Four of the five groups stay in the classroom while one uses a small room, typically used for lawyer visits, around the corner from the classroom. Given the space and noise constraints of the classroom, it’s really not possible to have more than four simultaneous conversations; otherwise we wouldn’t be able to hear the folks with whom we’re conversing. So, in total, our CWF visitor limit is five people. To start our visit, each CWF volunteer introduces him/herself to the three to eight men with whom they’re visiting, providing an overview of who we are and what we do. But it’s also important that the attendees understand who we aren’t. We tell them: we’re not with ICE, we’re not lawyers and we don’t provide professional advice. We’re not here to convert you or sell anything. We’re simply here to be in solidarity, to be present. We’re people of faith and people of no faith. We’re members of our communities, some from Albert Lea, MN, another from Rochester, MN, others from the Twin Cities, all of whom strongly believe we’re all brothers and sisters. We’re here to talk with you about anything you want: your families, where you’re from, what you’re experiencing, the current administration in Washington, DC, recent news stories, etc. We don’t cross-examine, ask what crimes, if any, have been committed, or ask why you don’t have documentation. Left to right: Rev. 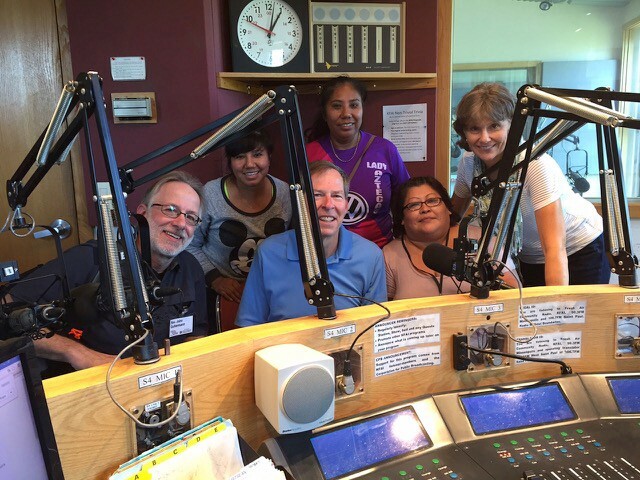 John Guttermann, Steve Kraemer, and Mary Lorentz (far right), together with KFAI “La Voz del Pueblo” hosts during a 2015 radio interview. John, Mary and Steve were among the original group of visitors who made their first visit to the Ramsey County Adult Detention Center on March 27, 2011. After the introduction, we pass around a spreadsheet and ask the gentlemen to write down their full name, “A” (alien) number, date of birth, and country of origin. That way, we’re able to keep track of them in the ICE online locator system so we know whether they’ve been transferred or appear in the system as “Not In Custody” or “Detainee Not Found.” As a result, before a volunteer decides to carefully write a letter to a gentleman, he or she can first determine if he is still in the detention center, thus dramatically reducing the likelihood of letters being returned undelivered. During the course of our conversation, we make sure to ask the attendees four questions to determine if they would like to participate in any or all of the programs we offer. The first question is: would you like to be part of the “Circle of Compassion?” If they say yes, we add their name — first name only — and their country of origin to a list we circulate once a month to various faith communities whose prayer groups in turn will hold them and their families in thought and prayer. Second, we ask the men if they’d like to receive a letter from one of our letter writers. We don’t call it a pen-pal program (which implies a two-way correspondence) because we realize some aren’t used to writing letters, or don’t have the supplies or language skills to do so. They can receive letters from us without feeling any pressure to write back. The participation rate for these first two programs is extremely high — I’d say about 95 percent. Next, we note that if they have ten dollars or less in their commissary account, we can make a very modest kiosk deposit to help fund purchases of food, personal hygiene items and/or phone calls. Then, we ask if they would like a modest donation. It’s on the honor system. Lastly, we ask if they have a particular book or author they’d like to read. The facility has a well-stocked library of the many books we’ve donated over the last year, but we can fill specific requests. These folks have much time on their hands, and it’s life-affirming to receive books in their native language, or on a topic that has special meaning to them. If they say yes, we ship it to them as soon as possible. After these four questions, the conversation begins to flow. Sometimes, it’s more than a conversation. For instance, during a visit about a year ago, I suddenly asked the group, “Who’d like to sing a song?” Well, of course, they were bashful and pointed to their neighbor, so I said that if they didn’t sing, I would! Next thing you know, we’re singing and clapping our hands — almost everyone joining in, and smiling and/or laughing. Ever since, we’ve been singing for the last 10–15 minutes of every one-hour visit. One time, I brought some Spanish song sheets and asked the guys to pick their favorite. They chose a Mexican piece called “Árboles de la Barranca” (“Trees in the Canyon”) and really belted it out! Another time, one of our volunteers got permission to bring a guitar. I’ll never forget the gentleman from Thailand who sang a song about his wife while playing the guitar, the beauty of it producing tears in a number of listeners. The goal is to make a hellish situation just a little bit better, a little more bearable. We let the gentlemen know that we truly care about them in this time of fear, pain, loneliness, and uncertainty. We shake their hands, pat them on the shoulder — provide a bit of human contact from the outside they wouldn’t otherwise get. Even their families can’t provide that; they’re not allowed private visits. Instead, they have to sit at a computer in a separate room on a different floor and communicate with their loved ones through a video chat, similar to a video Skype call. Sometimes you wonder: does any of this — visiting, writing, etc. — really make a difference to those living in our tragic and unjust system? Last night was very hard — my thoughts were everywhere — fear of the unknown, worrying too much about what I am going to encounter, how to even have social communication and conversation after so long not living and working in Ethiopia. My head was heavy. Then I woke up and went for breakfast, and there I saw my last name on the mail list … [It] made me feel joyful and forget about my last night nightmare. When I got the letter and opened it, I saw the beautiful picture with a butterfly and deep message. Soon my spirit lifted up. How great it is that I got your message today. What a big difference today is compared to yesterday’s depression and stressful day and night. As for the CWF volunteers? They see diversity in a way they never could have imagined. They see the brotherhood of the men they visit, their solidarity. It’s beautiful. These men in detention … they’re role models for us, showing us how we should live, respecting each other, helping and supporting each other, changing the world by being brothers or sisters to others.